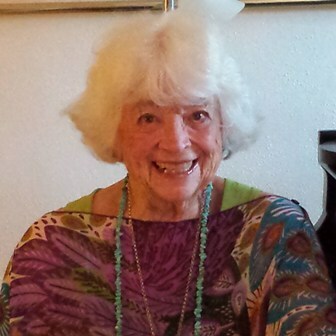 Eileen Watson passed away in Sarasota, Florida on Thursday the 29th of May at the age of 96. Born on October 7, 1917 in Hamburg, New York, Eileen left home at 16 and put herself through nursing school. She earned her degree in 1940 as a member of the first graduating class of the University at Buffalo’s School of Nursing. Along with her husband Bill, Eileen started the Wm. L. Watson Pool Co., the first in-ground swimming pool business in Western New York. She and Bill enjoyed many years of partnership in life and work in the Kenmore area. Eileen loved sports and after being introduced to skiing in the early 1960s, she and Bill purchased and restored a Victorian vacation home in Ellicottville. Her entrepreneurial spirit and her love of skiing and shopping led her to start the first ski shop at the Holiday Valley resort. Eileen spent her retirement years in Florida, painting and volunteering at the Sarasota Art Center, providing musical entertainment for nursing home residents throughout the Sarasota area, and golfing and socializing at the Sara Bay Country Club. She will be remembered for her love of travel, music and art, her generous and colorful spirit, and ever-present sparkle and wit. Eileen is survived by daughter Patricia (Tom) Dankert and son William (Dorothy) Watson; grandchildren Suzy (Tom) Dunkleman, Jay (Laura) Watson, Elizabeth (Sean) Lowes, Guy Watson, Dee (Bob) Derr, and William Worden Watson II; and 25 great grandchildren. She is predeceased by her husband William Lawrence Watson, brother DeWitt Fowler, sister Grace Bley, and companion Anthony Iannacone. Visitation will be held Saturday, June 7th at the United Church of Ellicottville from 1 - 2 p.m., at which time funeral services will be held with Rev. John Woodring officiating. Memorial donations may be made in Eileen’s name to the United Church of Ellicottville, P.O. Box 417, 53 Elizabeth St., Ellicottville, NY 14731.